I’ve never owned a car with fewer than four doors, so I don’t get the antipathy many of my fellow car nuts feel for sedans, but as a fan and past and present owner of several wagons, I’m glad these family haulers have found the love their be-trunked siblings often can’t. 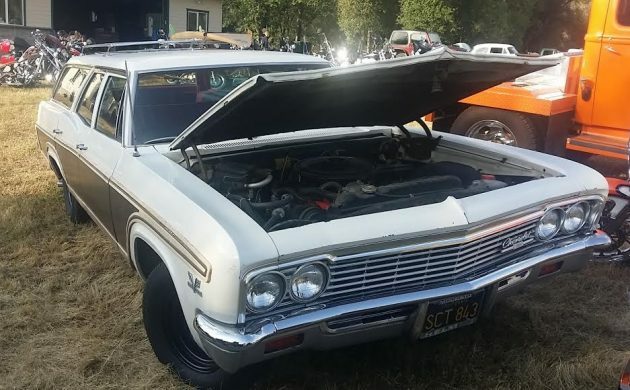 With a wood-paneled cruiser like this ’66 Caprice, a lot of that love can probably traced to nostalgic memories of riding in the “way back”—whether there was a seat back there or not—and making faces out the rear window at passing traffic. 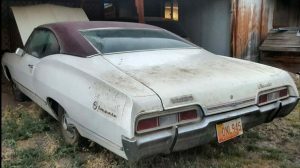 In any event, this is a lot of car to love, and I hope it finds the right new home…maybe even yours! If you think it could be, find it here on eBay out of Everett, Washington. As it happens, there is no rear-facing third row seat in this six-passenger wagon, so any kiddos back there will be on the loose—and had better find something to hold onto. The headline news is the numbers-matching 396-cubic inch V8; it’s no 427, but with an advertised 325 horsepower, it will certainly do. 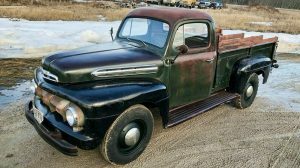 It’s been brought back to roadworthy status after sitting for many years with a rebuild Quadrajet carb, new alternator, oil pump, fuel pump, fuel filter, air filter, transmission lines, fluid, filter, and vacuum pump, some brake work, and more. The major outstanding need is tires before this wagon is truly ready to pound the pavement once again. 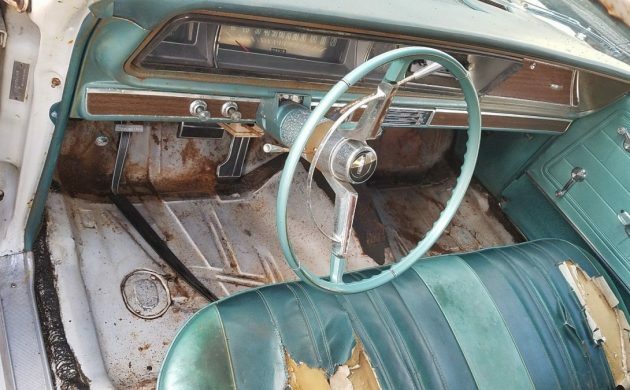 How you feel about the car’s current cosmetic condition is up to you; fans of the “P-word”—I won’t say it!—may like it just fine, or you may agree with the seller’s assessment that it’s “an interior, paint, and some TLC away from being a great ride.” Certainly the turquoise interior is a snazzy companion to the wood-trimmed Ermine White exterior, and I might gently suggest it would pop even more (and be quieter and more comfortable) with some matching carpets. At least the floors are in good shape! 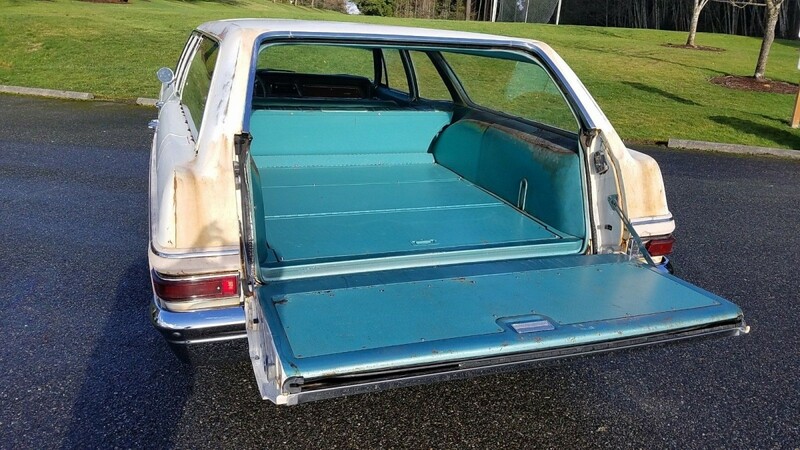 The rear bench is in better shape than the front, and the massive cargo hold doesn’t look bad at all; the seller even has the original snap-in carpet for the cargo floor, a luxury feature to distinguish the top-of-the-line Caprice from lesser Chevy wagons. 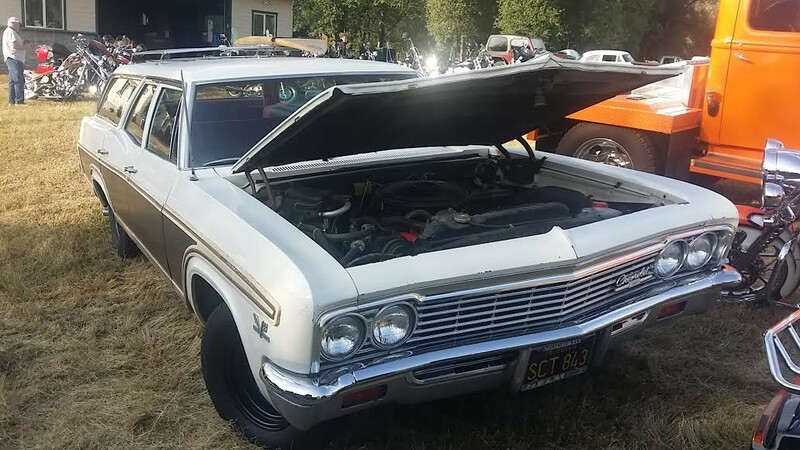 Outside, the major trouble spots are the lower rear quarters and along the bottoms of the rear quarter windows—nothing that won’t be familiar to fans of GM wagons of this era. 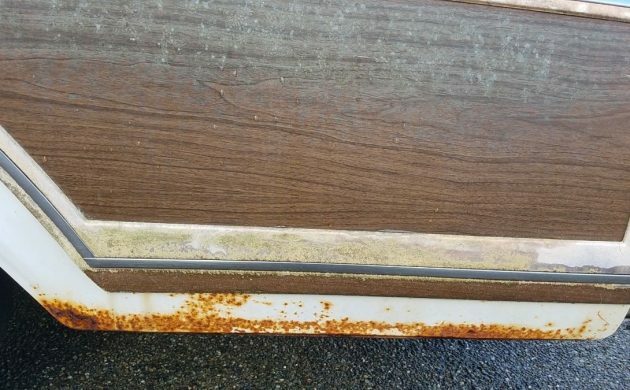 The underside of the wagon seems solid, and even the rust-prone spare tire well is in good shape, so that’s the good news. 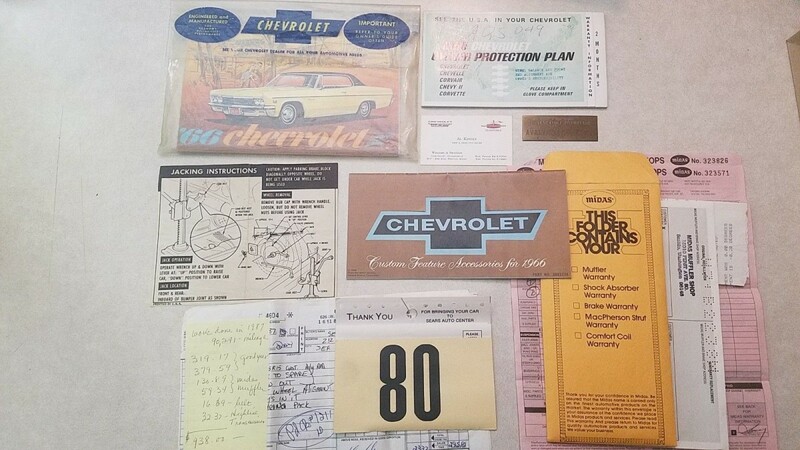 The owner estimates the mileage at a relatively low 120,487, and a great deal of original documentation comes with the car. 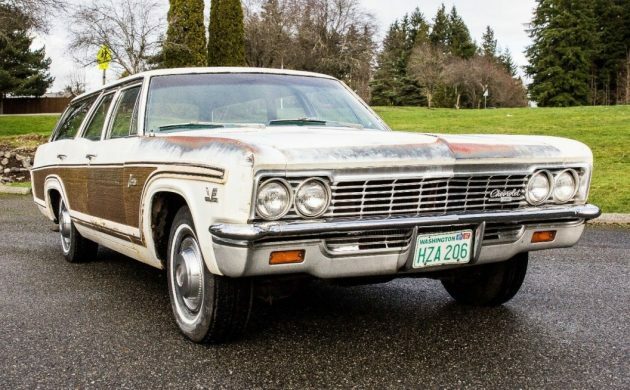 There’s plenty of potential in this nostalgic wagon, and also plenty that it has to offer exactly as-is; what would you do with this big block survivor? Here’s a memory. In HS, my buddy’s mom had a car just like this, a 396 with the smallest 2 barrel I ever saw. He beat the heck out of that car. One day, whilst mashing the gas pedal, a lifter stuck, and rattled. He parked the car in the garage without telling his mom, and 3 days later, she came home with a brand new 1971 lime green Pinto. 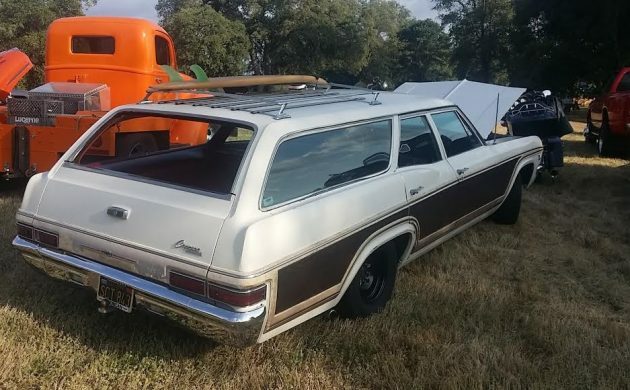 With the recent interest in big wagons again, looks like a nice example to beat the heck out of, I mean drive, if you can afford the gas, that is. Your buddies mom had a 69 full size wagon, the only year for a 396 two barrel. I would love to have had it or this 66! But what I really want is a loaded 66 wagon with the then common but now rarely seen tilt / telescopic steering wheel. Plus power windows and comfort -tron A/C! But again this one will do nicely! Add dual exhuast, Ralley wheels and front disc brakes and drive it! I love it, and 5 years ago I would have never said that.These behemoth Chevy, Ford, and Pontiac, wagons along with the Olds Vista Cruiser, have really grown on me. I would really enjoy seeing this beauty restored to its former glory. I can only imagine all the memories in these cars, the picnics, the family vacations, the trips to the supermarket, “dad can I borrow the car”? and all of the “are we there yet ?” from the back seat. Ahhh yes, people seeing the USA in their Chevrolet. Good times indeed, good luck to the new owner. When it comes to wagons like this, a general rule of thumb comes to mind: Buy the best best one you can with the money you have. Don’t settle for a “One day it could be a..” and then find out you bit off more than you can chew. 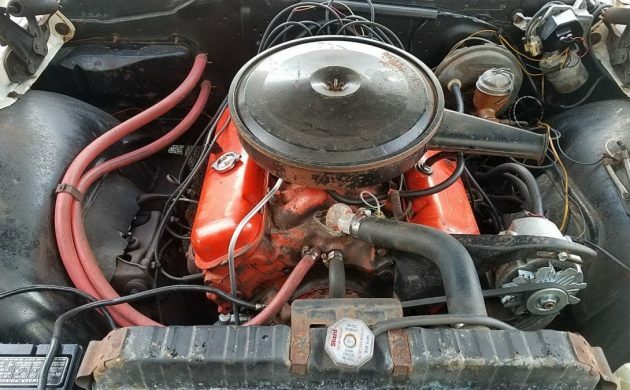 When it comes to `66 Caprice estates, I would pay a bit more and get one a bit more complete. Your wallet will thank you for it down the road. OK; so maybe you have to settle for a 327 instead of a 396 4bbl. ; big deal. 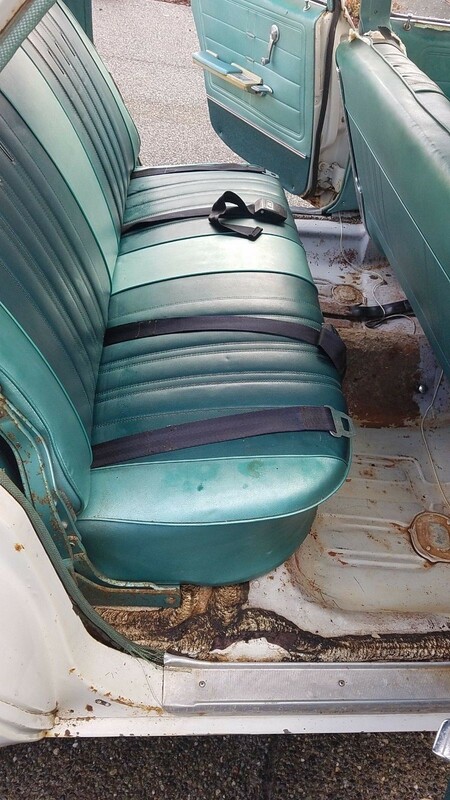 Your find may have less rust, a complete interior, and maybe, just maybe a few goodies like power windows/seat.The better you buy, the less you need to put into it. Been seeing a lot of these 396 Chevy wagons surfacing lately. Until in recent years, I never knew there was such an animal. Does anyone know if these big block wagons could be (or were) ordered with a four speed? Now that would be really fun. 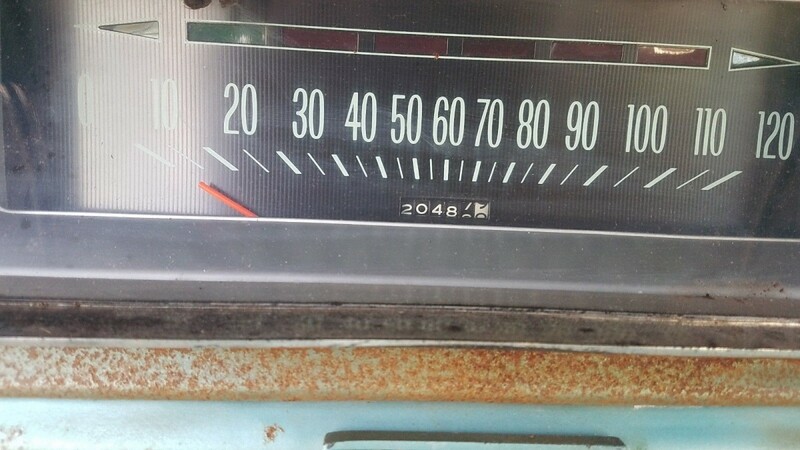 my aunt and uncle had a 63 or 64 Chevy Station Wagon with a shifter on the floor, I don’t know what engine it had, probably a 327. I know they ordered it that way. Not sure what model it was either. It might have been an Impala station wagon. It was an oddity back then. 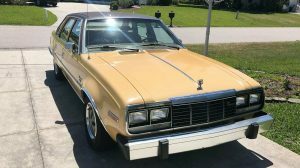 In the late 70’s, with two small children, I bought a ‘66 Caprice wagon, white with wood trim and black interior, nicer than this one, about 70k miles. It used some oil but was reliable transportation. What would I do with this survivor? Well, first and foremost, because it needs new tires, I’d power brake the h*** out of it, see if that big block had any grunt left in it. This is what America needs again! 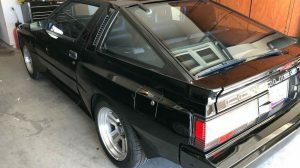 I grew up in mostly in the eighties, where American cars were laughable, unless you had a classic. My father bought Japanese, and was always flying us to see the WWII vet relatives in fear of hearing about what he drove, and sadly we didnt see enough of them. When we got there, we’d here about the problems they were having with their cars, and we had and saw enough of it ourselves. Heard, I’ll never buy one of these ever ever again enough to be biased against American to this day! My family has been through some rough times the last couple years though, and I have to say that there’s a Buick century, and a Chevy uplander in my driveway right now, both nearing 200k. I curse them everyday, but thank you GM, and thank you America! A friend’s mother had one. His dad got royally p-o’d when the motor mounts broke, accusing the then 16-year old of hot rodding. Turns out the torque monster motor was pretty brutal to the motor mounts on a lot of these cars. Comet you could get with a 4 speed. there was a plain jane 66 here in NY with a factory 427 4 speed. I had a lot of wagons and enjoyed all of them, this one could be real nice but the rust around the windows, as the guys said, would be a bear to fix. 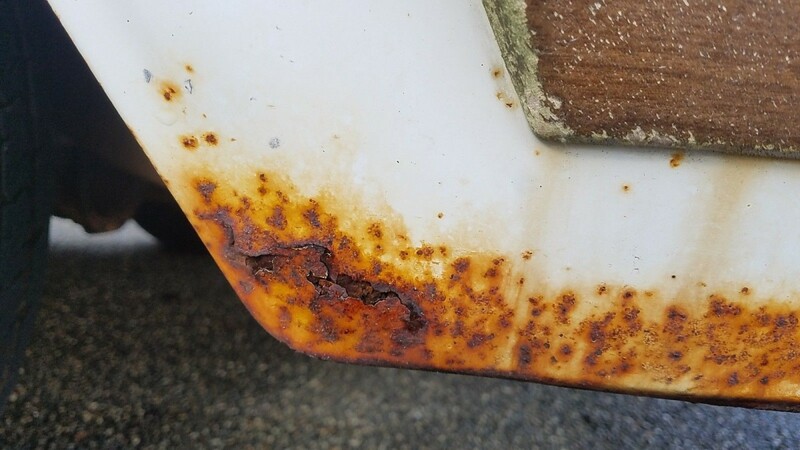 Interesting rust pattern on this one, especially for a Washington state car. Good luck to the new owner. Considering a Paxton; any comments? 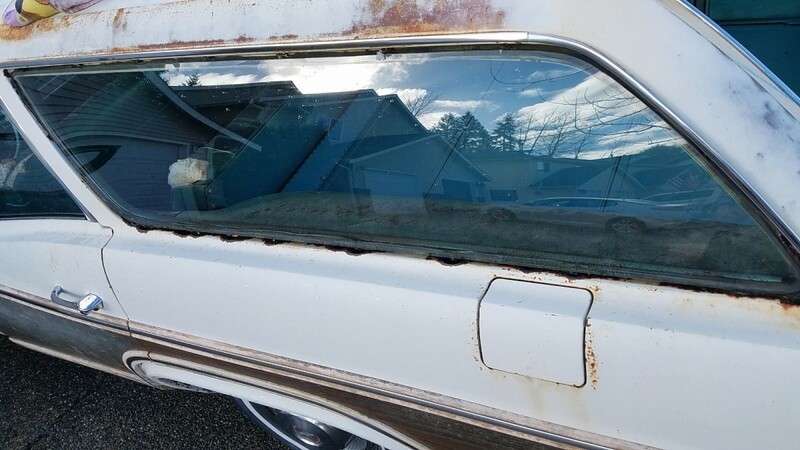 I have a 1969 Kingswood that also has rust coming from the inside out through the side windows. 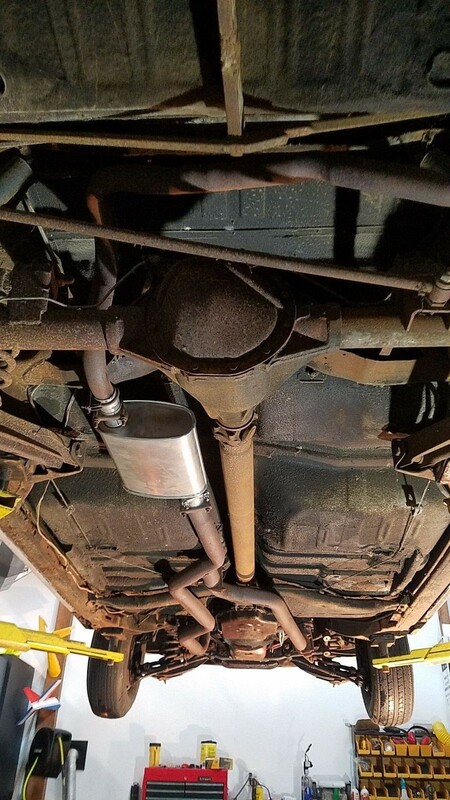 I am going to have to take the whole car apart to stop the cancer.